We had 662 responses to our initial questionnaire which is a 38% response rate – one of the highest of any Neighbourhood Plan in Cornwall. Thank you Porthleven! The next stage will be to produce a more detailed questionnaire. We’re currently writing this and it will be distributed via mail and online in the next few months. 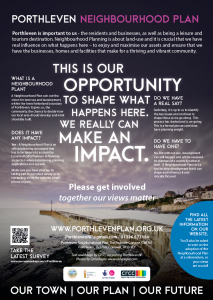 Make sure you have your say in the future of Porthleven by completing and returning your copy.The next stage will be to produce a more detailed questionnaire. We’re currently writing this. All the information we’re gathering will feed into the final draft of the Porthleven Neighbourhood Plan (PNP) and we need to make sure it’s a document that represents the views of the local community. Find out more about what a Neighbourhood Plan is and why we need one here.